5mm PVC sign. Can be drilled for easy wall mounting. Symbol comply to AS/NZS 2416:2010 PVC signs are to be wall mounted only. If pole mounting is required, Aluminium signs are available on request. If the sign is to be stuck on glass, stickers are available with clear or white background. Size: 450 mm x 600 mm (W x H) Max. Viewing Distance: 20m..
5mm PVC sign. Can be drilled for easy wall mounting. Symbol complies to AS/NZS 2416:2010 PVC signs are to be wall mounted only. If pole mounting is required, Aluminium signs are available on request. If the sign is to be stuck on glass, stickers are available with clear or white background. Size: 450 mm x 600 mm (W x H) Max. 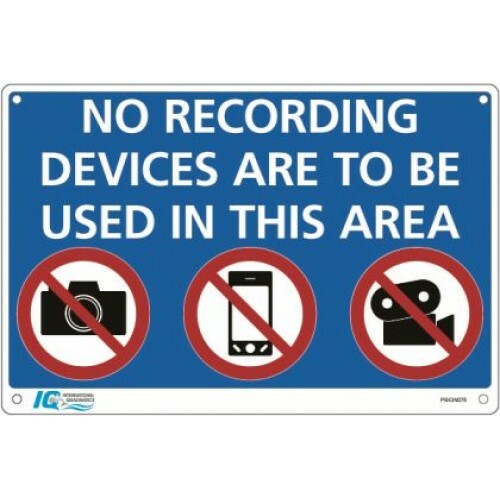 Viewing Distance: 20m..
Use in areas where recording is prohibited like change rooms, toilets or fitness areas. Polypropylene sign with four pre-drilled holes for easy mounting. Size: 450 mm x 300 mm (W x H).. Polypropylene sign with four pre-drilled holes for easy mounting. Aluminium signs available on request.​ Sizes: 300 mm x 450 mm (W x H) 450 mm x 600 mm (W x H)..